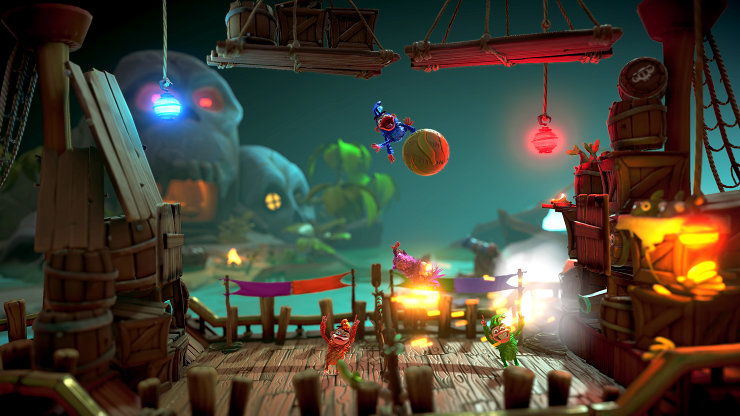 Given the one thing Sony’s PlayLink range of titles is known for is bringing people together for some local multiplayer fun, it seems a no-brainer that you would extend that to a virtual board game. The Mario Party series alone has proved that you can replicate the fun of those moments, and make the activities and party games engaging and make you want to come back time and time again when you’re either hosting guests or are sitting down together to play as a family. Chimparty is their stab at it, and unfortunately this one is unlikely to stand the test of time. 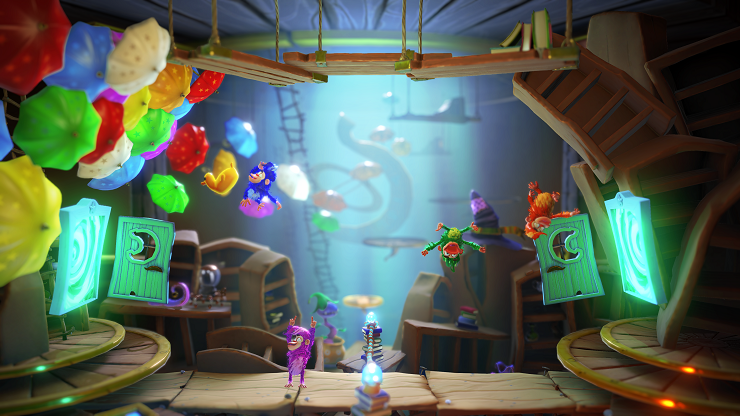 The premise is fairly standard, in that four monkeys are competing in a board game (with any unused monkeys being controlled as AI), and depending on your performance in them, you earn stars which allow you to move along the board. If you land on an occupied square, you move onto the next one, and the player in last place at the end of each round will roll the dice, move forward to catch up and wherever they end up determines the next mini-game. The winner is the person who can get nearest the banana treasure chest (because with monkeys, it is always bananas) at the end of the board. But, sadly, Chimparty suffers from two main problems, with the first being over-simplification. As per usual with PartyLink titles, you actually play on a phone or tablet having downloaded the appropriate app. And the control method in Chimparty is simply to press the big button that is in the middle of your screen. What pressing that button does depends on the mini-game you’re playing at the time, and specifically what is going in it at any point. For example, a press of the button could determine the angle of a jump, and another button press will determine the power. If there is a pole to swing off of, a press of the button will grab onto it, and then you release it when your monkey is at the right angle to determine which direction they jump off it. So it is definitely simple, but too much so. In the heat of the moment it can get confusing which button press can mean what, and if there had been at least a couple of buttons on screen, or a swipe option for example, to alternate between, it would make controlling your monkey easier. And given that a lot of the party games require you to move your monkey around effectively, it can be incredibly frustrating to lose because the control method despite its appearance of simplicity, is fiddly at times. It meant that often I wished I was playing with a controller rather than a touchpad, which is counter-intuitive to the PlayLink design. Chimparty’s other big mistake is not really rewarding those who win the mini-games properly. Performance is measured by pre-set standards, so if you achieve a certain score in a game, you get a certain amount of stars, with the overall winner(s) getting a bonus star. And whilst this does have its merits by rewarding the performance more so than the final ranking, the problem is when it actually plays out in the board movement afterwards. What tends to happen, is that the star difference is down purely to the single bonus star awarded for winning, and then each players move squares on the board by the amount of stars they earned. But given that if you end up on an occupied space you move to the next one, and the person in last place when everyone has finished gets a bonus roll, it can mean that it isn’t the person who won the last party game that is in the lead at all. In fact often the winner is the person with the most luck of landing on special squares which bump you forward extra spaces than actual consistent performance. And if this isn’t about winning mini-games to win overall, then what are we all doing in the first place? There is a decent variety of mini-games on offer, with 18 to choose from, with 5 different tweaks to put on each one. They range from doubles air hockey, to a top-down version of Splatoon, to a basketball level with monkeys as the basketballs. The ones that have fewer context-sensitive button press controls are the best, as they are easier to play and enjoy. 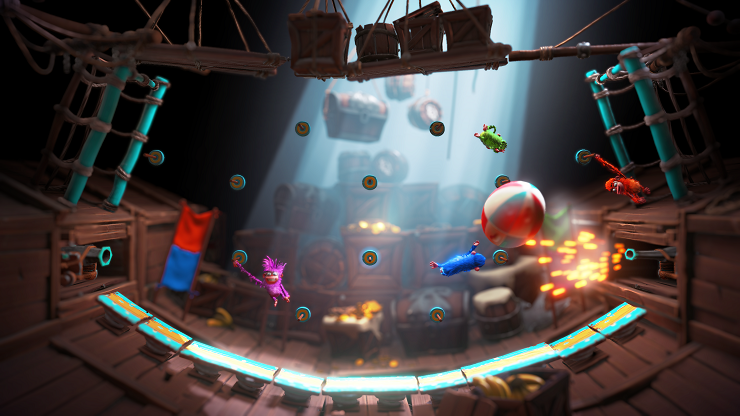 There is also unlockable cosmetic items to adorn your monkey in as you play as you collect more stars, which is a fairly shallow attempt to promote replayability, but will likely appeal to younger audiences, as will the cheeky and colourful aesthetic of the monkeys themselves. The fact that there is only a single board, that is only a collection of squares and nothing more seems like a missed opportunity to throw more variety into the mix and make it more interesting. Ultimately Chimparty is a bit of a mess. 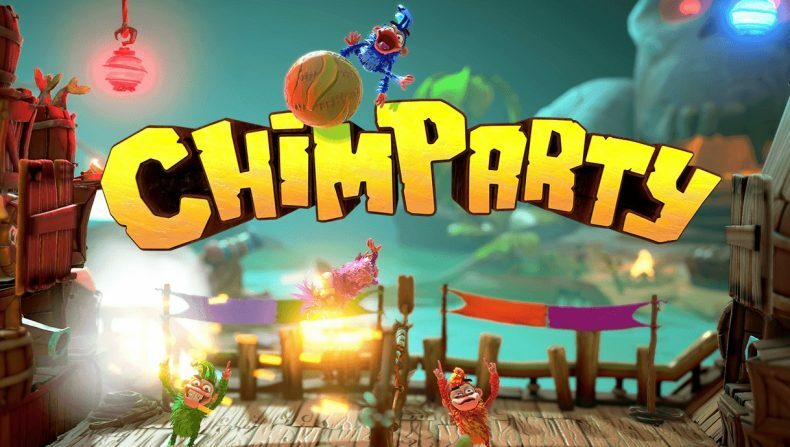 Whilst some of its party games are entertaining and there’s no doubt children will enjoy the monkey japes and sometimes frantic action on offer, the simplified controls will end up frustrating you at times, and when you are up against the clock, this is never a good thing. But what will most likely prevent you from coming back is that Chimparty doesn’t reward good performance in the mini-games in a meaningful way, and winning the ultimate prize can be down to luck. That’s great if you want to give everyone a chance of victory, and such a thing shouldn’t be sniffed at, especially with younger audiences, but that shouldn’t be at the detriment of rewarding a good performance otherwise competing in the first place loses meaning. Fundamentally there are better alternatives of party titles out there, that still feel inclusive and fun and simple to play, and as such Chimparty is unlikely to get an invite the next time you have friends or family round.